The Italian verb for inflate is the irregular -ARE verb gonfiare. 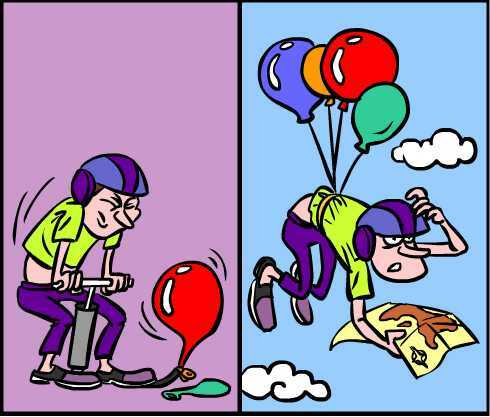 ... imagine after INFLATING the balloon he has GONE FOR A flight. Gonfiare can also mean: to blow up (with air), to pump up, to puff up. - gonfiarsi (vr : to swell (up), to fill (up), to become swollen. - gonfiabile (adj) : inflatable. - la gonfiatura (nf) : blowing up, inflation; exaggeration, hype (fig). - gonfio (adj) : inflated, puffed up/out; distended, swollen. These verbs ending in -iare are irregular because they drop the ii to i in the Present and Present Subjunctive tenses. Verbs conjugated in this way include : assediare, cambiare, annaffiare, espropriare, finanziare, gonfiare, graffiare, mischiare. Inflate your confidence, learn Italian quickly and effectively with techniques like Cartoon Memory Triggers. To remember a word, just think of the pic! he has GONE FOR A flight. non gonfiare! (non) gonfi! (non) gonfiamo! (non) gonfiate! (non) gonfino! ✔ Gonfiare is an irregular -ARE verb, these being the most common verbs in Italian. ✔ Learn gonfiare and it will reinforce the pattern for ALL those other -ARE verbs. ✔ You can more easily remember words and verbs like the Italian for inflate - gonfiare using the techniques of the world's Memory Masters. 200 Words a Day! Free Daily Italian Lesson Online - the verb in Italian for inflate is gonfiare - fully conjugated. Italian Learning Made Fun and Fast with your free Daily Italian Verb Lesson - gonfiare.